Mesmerising, intricate, complicated, and very, very clever. Imagine this. You sit down with a book you’ve been sent – it’s a title for the Young Adult market from an author you’ve not yet experienced, and from the blurb you’re getting a David Mitchell/Cloud Atlas-ish vibe already. With notebook on lap, and pen in hand you settle down for another literary adventure, with the suspicion at the back of your mind that it’s not going to be as simple a journey as you thought. Several hours later, you find yourself sifting through your trusty notes to try and confirm what just happened. Ladies and Gentlemen – that is your brain after experiencing the outstanding ‘The Ghosts Of Heaven‘ by Marcus Sedgwick. To begin with, you have to make a decision: to read the four individual stories in the conventional order that they are printed in the book, or throw caution to the wind and read them willy-nilly. The choice is completely yours and you are actively encouraged to do so, although we are told that Sedgwick recommends reading it from beginning to end and to be honest, I do too. This is a novel that’s overflowing with re-read potential, but for a first read through, I’d go from ‘Quarter (as they are referred to) 1 to 4 without deviation. 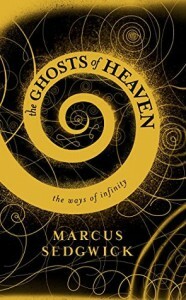 Do not be perturbed by ‘The Ghosts Of Heaven‘ shortlisting for the Costa Book Awards Best Children’s book. Much like ‘The Book Thief‘ this is a novel that will be sold to adults in such quantities that it’s categorisation will soon be blurred, but I do genuinely question it’s placement as a YA novel. If you like your literature to be clever and thought-provoking while still providing thrills then do yourself a favour and grab a copy. Then pass it on. And then be prepared to rave about it to whoever’s read it.